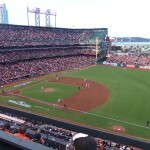 This year Michael and his Roommate Nick had the pleasure to see the World Series live and in person in San Francisco. This year the Giants swept the Detroit Tigers to win their second World Series in 3 years. The Excitement in the crowd was un-containable in San Francisco for game one and it would set the tone for the Giants for the rest of the series.